With the score tied late in the third period of a preliminary-round game between the East Coast Wizards and Detroit Little Caesars at this year's USA Hockey Tier I 14 & Under Girls' National Championship, it was time for the Wizards to swap goalies. During a stoppage, East Coast goalie Danielle Bernstein skated off and was replaced by fellow goaltender Daisy Boynton. To those who haven't seen the Wizards play previously, it might look like Bernstein was being pulled because of her performance. But for this Massachusetts-based team, this is just standard practice. Wizards head coach Mike Girouard has used a system like this for the past six seasons where his goalies rotate in and out of the game every four minutes. While this strategy might seem a bit unconventional, it has proven to be successful and is even starting to gain traction across the country. Girouard began coaching this current group of players since they were at the 10 & Under level and employed this multi-goalie strategy from day one. It's something he picked up from a high school coach he worked with who used to switch goalies each shift. While Girouard doesn't switch that often, his goalie changes every four minutes during a stoppage in play. At first, Girouard instructed the goalies on when to come out. But with the netminders having years of experience in this system, the players switch on their own. "Sometimes I don't even know who's out there," Girouard joked. Girouard said his goalies have not had any complaints about splitting time. He said he can see this system help their camaraderie. Each time the two switch, they stop and greet each other while giving each other words of encouragement. The strategy paid dividends as East Coast made it to the semifinals where they eventually fell to the Chicago Mission. When he first saw how Girouard rotated his goaltenders, even in such a crucial game, Phil Osaer, the American Development Model manager for Goaltending, viewed it as a great innovation. Since his first experience with the multi-goalie system, Osaer has implemented the strategy with his own teams and has seen others do the same. "The best part is that the other players really enjoy seeing the goalies switch so often," said the former Ferris State University netminder. "The goalies enjoy it too. They get to be treated just like any other player." And that means providing youth hockey goalies with equitable playing time, which will ultimately aid in their on-ice development and their off-ice demeanor. "We don't want to think of any goalie as a backup," Osaer said. 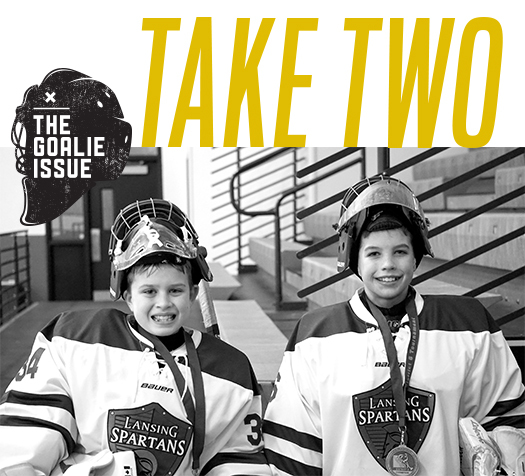 "The rotation system allows kids to only sit out for five or six minutes and they're getting back into the net. It also gives coaches to opportunity to instruct their goalies during the game as well as be around their teammates more. Frankly, they also get to skate a little bit more as well." Osaer put those principles in to practice this past season was the 2006 Lansing Spartans out of Lansing, Mich. The team went onto a district championship behind a goaltending duo of Reed Drouare and Zachary Jaakkola. While this duo isn't as experienced at rotating as the East Coast tandem, the system has been a hit with the players and their parents. "We loved the idea because it let both of them stay active during the game," said Reed's mother, Gayle Durning. "It keeps them engaged for all three periods. They're more a part of the game." For Melissa Jaakkola, Zachary's mother, she's seen the two goalies come together and form a special bond. "[Zachary] really likes it because he has Reed's back and Reed has his back," she said. "They're truly happy for each other when they succeed." With all of the success of this trend, both Osaer and Girouard plan on sticking with this strategy. When asked if there's a situation where he would use only one goalie, Girouard pointed to a unique circumstance. "Earlier this season, we had a shootout, and I stuck with the goalie that finished the game," he said. "I thought about switching them and might even do that in the future."